Vapour Organic Beauty's Atmosphere Soft Focus Foundation ($48) is a light-weight, liquid foundation made with 70% Certified Organic ingredients and 30% natural mineral pigments & vitamins. The foundation comes in 11 shades with different undertones. The chemical-free formula works with most skin types and leaves a radiant, healthy glow, with a semi-matte finish. I got to try out two shades s130 and s135. During the summer when I had a stronger tan, I was right in between these two shades and now s130 seems a little more perfect than s135, which looks a tad orange on me. The foundation, packaged in a pump tube, has sheer-medium coverage that is buildable. The texture is that of a thin liquid so, it blends better with fingers. A dense, buffing brush works great too. If you have very dry skin, I would recommend a good moisturizer since the formulation tends to enhance dryness around certain areas. The product also has a slight smell which I'm not quite sure what it is but, fades pretty fast once blended in. As far as the staying power goes, with a good primer on, it stays put for about 7-8 hours without becoming oily or greasy overtime. Since this is medium coverage, finish is quite natural but you may still need a good concealer for problem spots and blemishes, if any. If you are like me and don't like heavy foundations, this one is definitely worth checking out. I wish it was just a little more moisturizing on my combination/dry skin, considering how pricey it is. It is also a great pick for sensitive skin since it is paraben-free and does not contain pore-clogging stuff like mineral oil. 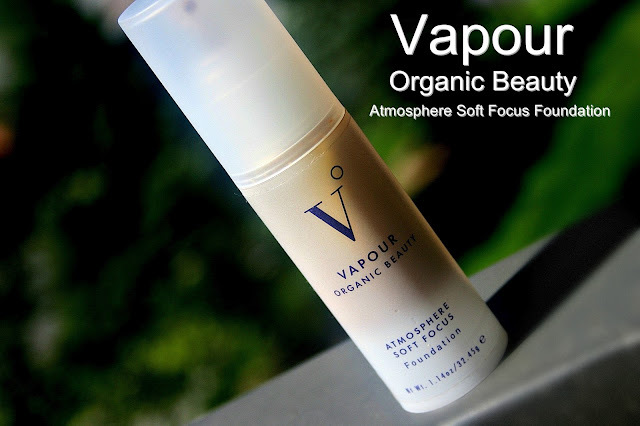 What are your thoughts on the Vapour Organic Beauty's Atmosphere Soft Focus Foundation?